"The Frog King" by Adam Davies is an entertaining novel about a young man, working for a lousy salary as an assistant editor at a well-known publishing house. Beside failing at his job, he is also constantly working on failing in his life in general... which makes the reader feeling sad for the main character most of the time, as he navigates himself deeper and deeper into problems as the story goes on. Nevertheless it's amusing to see this young man struggling, who is so self-absorbed that he might also lose the woman he truly loves. The novel will be adopted by Bret Easton Ellis to serve as a script for a movie. A mediocre book leaves you cold. But an almost-great book--that's enough to make you gnash your teeth. 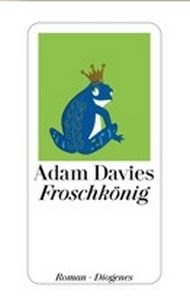 In his debut novel, The Frog King, Adam Davies maddeningly fails to recognize and develop the terrific material he has at hand. Harry Driscoll, raised in privilege and Ivy League-educated, is a peon at a prestigious New York publishing house--in fact, the house is called Prestige--and he hates it: hates the menial labor, hates the intellectual pretension, hates the political jockeying necessary to advancement. Driscoll is terrific on the disappointment peculiar to the overeducated and underemployed: "All those years of schooling (Yes I speak Old English!) and resumé building. (Yes I interned on Capitol Hill!) didn't pertain at all to the life that was waiting for me." The insider peek at New York publishing is terrific, too, if scant: "There's a joke at Prestige that The New Yorker will publish any story that ends with the word 'home.'" Davies devotes most of his energy, however, to Harry's somewhat mystifying relationship with his girlfriend Evie. He loves her madly, but he's sleeping around. When he loses her, he continues to lie to her even as he tries to win her back. Davies may have some kind of emotional profile in mind for Harry, but he fails to put it across to the reader. Fortunately, the well-observed social comedy and nicely exaggerated workplace farce more than make up for the rest of the novel's shortcomings.